The job of a carrotmobber is simple: come out and enjoy a cup of coffee with a friend. The benefit? You get to help save the planet and boost a local coffee shop! 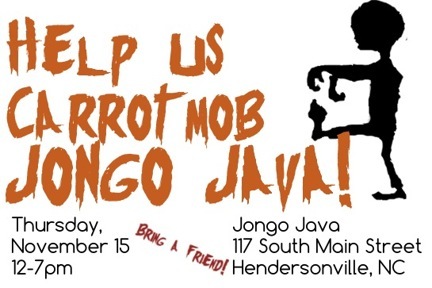 Jongo Java in Downtown Hendersonville is agreeing to put 75% of profits from sales toward energy efficient lighting on November 15th from 12-7pm. That’s where YOU come in! Come out and enjoy a full line of organic coffee drinks, smoothies, and baked goods. Carrotmobbers can expect the warm atmosphere of a coffee shop as well as a carrotmob party with music and socializing. Showing support for this local coffee shop’s desire to do something good is a great way to tap into your own desire to better the community. Hendersonville’s own Environmental & Conservation Organization is always finding new ways to encourage environmental stewardship. Organizing this carrotmob is an opportunity for ECO to help gather visible support for changes toward environmental sustainability, specifically in the business community. The best part? Everyone wins!